Hastings Priory lost to Horsham off the final ball of a Sussex Cricket League Premier Division thriller yesterday (Saturday). Priory were edged out by three wickets in a game containing 530 runs and 17 wickets at a sunny Horntye Park, despite a brilliant hundred from Joe Billings. Priory were all out for 263 off the last ball of their 50-over allocation after winning the toss and choosing to bat. More than half of their runs were scored by Billings, who made 143 off 141 balls with 17 fours and a six. The hosts suffered an early setback when Tom Gillespie was LBW to Jamie Thornely (9-0-65-4) for a single. And after Ryan Hoadley and Greg Devlin fell to the same bowler for single digit scores, Priory were 41-3. Billings and Jake Woolley compiled the partnership Priory were looking for, putting on 74 for the fourth wicket until Woolley was run out by Joe Ashmore for 24. James Pooley and John Morgan quickly followed to Nick Oxley (10-1-36-2) as 115-3 became 129-6. Billings and Jed O’Brien advanced the score to 160 when the latter was leg before to Paul Williams (8-0-55-2). Hastings Priory captain Tom Gillespie at the crease. A terrific eighth wicket partnership of 94 between opener Billings and number nine Josh Beeslee was crucial in getting Priory up to a competitive total. The stand finally ended when Billings was caught by Mika Ekstrom off Williams. Beeslee went on to make 35 off 45 deliveries before becoming Thornely’s final victim off the very last ball of the innings. Although Adam Pye (8-0-64-1) had Craig Gallagher caught behind by Billings 31 runs into Horsham’s reply, the visitors appeared well on course for victory as Tom Haines and captain Michael Thornely fashioned a superb second wicket partnership of 190. 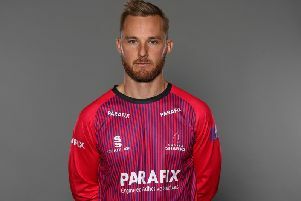 But after Haines, who was called into Sussex’s squad for the Royal London One-Day Cup match against Essex at Eastbourne today, was caught and bowled by O’Brien (10-1-32-1) for 110 off 117 balls, Priory fought back valiantly. Priory number three Ryan Hoadley pushes into the off-side. Thornely followed eight runs later, caught behind off Morgan (10-1-40-1), for 92 from 127 balls and the incoming batsmen found it difficult to keep the scoreboard moving at the rate they would have liked. Jack Coleman (7-0-41-1) pinned Oxley leg before for 13 prior to Beeslee (10-0-54-2) having Ashmore and Tom Johnson stumped by Billings. And when Beeslee ran out Rhys Beckwith for 10, Horsham were suddenly 256-7. Sussex Premier League standings (all played five matches): 1 Roffey 130pts, 2 Brighton & Hove 126, 3 East Grinstead 111, 4 Preston Nomads 91, 5 Horsham 86, 6 Eastbourne 76, 7 HASTINGS PRIORY 69, 8 Ifield 65, 9 Cuckfield 60, 10 Middleton 52.